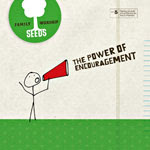 At the beginning of March, my friend over at The Adventures of Miss Mommy is sponsored a give away for SEEDS Family Worship CD's. Amazingly, I won! Now, I have my very own copy of The Power of Encouragement. If you haven't heard these CD's yet, I encourage you to check them out. They are Scripture verses put to music, written to involve the whole family in memorizing Scripture. We have been thoroughly enjoying our new CD, and would like to tell you about some of our favorite songs. Joshua's favorite song is Track 4 - Take Heart (John 16:33). He loves the upbeat song and especially love to shout "Take Heart" in the chorus of the song. Very fun! I have been enjoying two of the more melodic songs on this album, Track 3 - Cast Your Cares (Psalm 55:22) and Track 7 - Heavenly Lights (James 1:17). Both of these songs have encouraged me and reminded me of important truths just when I needed it. Check out these great resources for teaching scripture in a fun, memorable way! Hi Honey, Seems you won another book sent by D Smith. Congratulations! I took a look at their site when you mentioned it before and I really liked it. It was very encouraging. Thanks for sharing about it! Yea!! You have won THREE give-aways! Crazy! Too often, I think we forget the power of music in our lives and especially the effect it can have in our homes. Lucky you to win and I appreciate the recommendation!